Pre A1 Starters. Three Practice Tests. Mackay B., Osborn A. 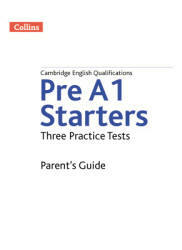 These new practice test materials for Cambridge English: Starters (also known as Young Learners English: Starters) support young learners and include comprehensive guidance for both teachers and parents. By working through the practice tests, children will feel ready for what they need to do on the day of the test, and will also have fun whilst they are learning. Pre A1 Starters. Three Practice Tests 2018. Audio CD (2018). The Collins practice tests book for Cambridge English Qualifications: Pre A1 Starters helps young learners to prepare for the Cambridge English Qualifications: Pre A1 Starters test. These three practice tests reflect the structure and content of the official test, providing authentic practice for students at this level. The Teacher's Guide and Parent's Guide are both available, free of charge, online at www.nhantriviet.com/CollinsYLE. 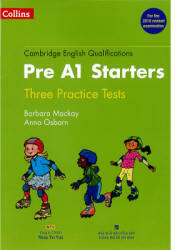 They contain a comprehensive overview of each section of the test, so that teachers, parents and students can become acquainted with the test. They are full of tips and ideas to help students to prepare for the test and they also provide full answer keys, scripts for the Speaking papers and audio scripts of the online recordings. They also include the official Pre Ai Starters vocabulary list. The recordings for the Listening papers, as well as model answers for the Speaking papers, can also be found in the Audio scripts & Answer Key booklet. These not only demonstrate the interchange between the student and examiner in the Speaking papers, but also give students the opportunity to practise speaking in English so that they can be fully prepared and confident about what to expect on the day of the test.